AB testing has historically been a bit confusing and mystical, like Professor Snape combined with an Excel spreadsheet. A Convince & Convert sponsor, Formstack gave me a trial account to see if I could create an AB testing program without any hand-holding whatsoever. In truth, I didn’t even read the manual or the help docs, because I figure you won’t either. Might as well test it for real, right? Well, it may not win any Webby awards, but my landing page design foray was a success. I have some ideas of video bloggers I’d like to see on Right This Minute, including Dan Dunn on booze, Lisa Beres on green living, and Baratunde Thurston on politics. Landing Page Design – Voila! I set up an account in Formstack, and created my first landing page. Since I really had no idea what I was doing, determining my overall layout was the first hurdle. Formstack provides 8 options, and while you can change it later if you like, it’s helpful to have some sense of what you want in advance. Have a pencil sketch before you start. The landing page design builder itself is the second screen you encounter, and is the beating heart of the application. It’s fully drag-and-drop and WYSIWYG, allowing you to add content, tweak it, move it around, etc. quickly and easily. You can change fonts, colors, styles, alignments, and other page elements. If you want to get crazy, you can add your own stylesheets. 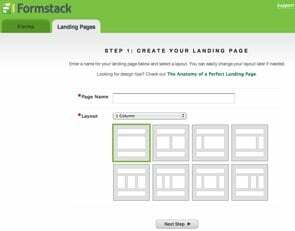 It is important to note, however, that despite offering a very easy way to do landing page design, Formstack is not drop-dead simple. If you have never created a blog post in WordPress, or used Web-based software in any way, you’ll still be able to get the hang of it, but you’ll have to think about it a bit. But, if you have even a modicum of experience with Web formatting, this will be a breeze. Pricing starts at $19 per month, which includes form hosting and technical support. You get a free trial for being a Convince & Convert reader. See below for details. Because I was collecting data in my landing page, I inserted a Formstack form into the landing page. Formstack has an equally easy-to-use form building tool that’s perhaps even more amazing, because of the array of form options, routing, thank you messages, email integrations, and other stuff it can do. Essentially, the Formstack forms can do everything custom-built forms can do, but you can build them yourself in about 10 minutes. The data gets stored in an easy-to-use database, and you can use conditional routing too. So if someone fills out your form and clicks the “urgent, I want to give you money now” button (your text may vary), you can auto-route via email the contents of that form to your best salesperson. The forms product is sold separately, and ranges from $14/month. Great for contest entries, too. 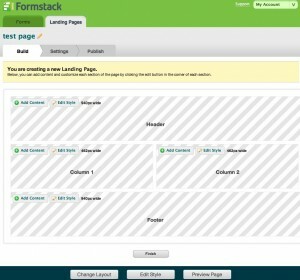 The newest version of Formstack includes the ability to easily handle AB testing of your landing pages. Wisely, they included a “duplicate” feature, so you can take an existing landing page, copy it, make a few changes, and publish the new one. Then, you are given a small piece of code to insert into the thank you page that appears after your conversion event (in my case, a form submission). You can – as I did – use the default Formstack thank you page, making it even easier. The software automatically rotates the two versions, and tracks which one is performing best in the AB test, via a simple tracking interface. Nice! In my test, I changed the color of the sidebar, the headline, and the arrow. Note that you can’t presently AB test the forms themselves, so you’ll have to use the same form on both pages – as I did – or create a new form (no “duplicate” feature yet). There’s a couple of slightly confusing points when you’re finalizing and publishing your pages, where perhaps some better explanatory copy would be useful. But considering the AB testing feature just rolled out this week, this new capability in Formstack is remarkably easy-to-use and stable. They aren’t amazing, but I made these landing pages and forms in Formstack for the very first time in under 60 minutes, without reading any support materials. Now that I’ve done it once, I’m sure I could do it in 30 minutes or less, and using the Formstack WordPress plug-in I’m looking forward to doing more with it here on the blog. Indeed I did. Just leave a comment on this post about a landing page you like and why (include the URL), and we’ll give free, 12-month accounts to comments we really like. And everyone receives a free trial of Formstack and 10% off a subscription if you use promo code ConvinceConvert11. New customers only, and only on the landing pages product.